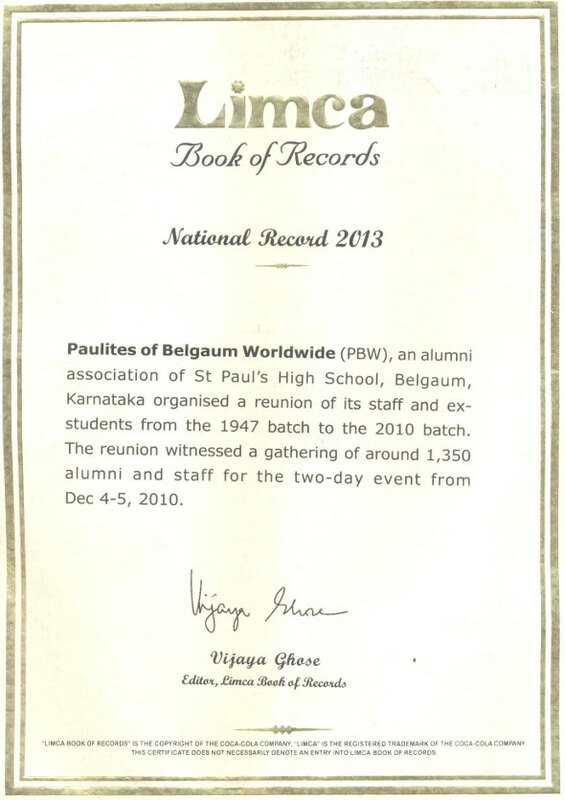 Paulites of Belgaum Worldwide (PBW), an alumni association of students of the St.Paul’s High School, Belgaum, had organised a reunion of its staff and students from the 1947 batch onwards to the 2009 batch. The reunion witnessed a gathering of around 1350 alumni and staff for the two-day event from Dec 4-5, 2010. With the families of the alumni’s present for the grand function the gathering had a crowd of over 1800 people. Sixteen retired teachers were also felicitated during the function. The Limca book of Records has now published the same as a National record.